On Wednesday, April 26, we are inviting the community to start and continue a conversation on the impact of drugs in our community and across the nation. 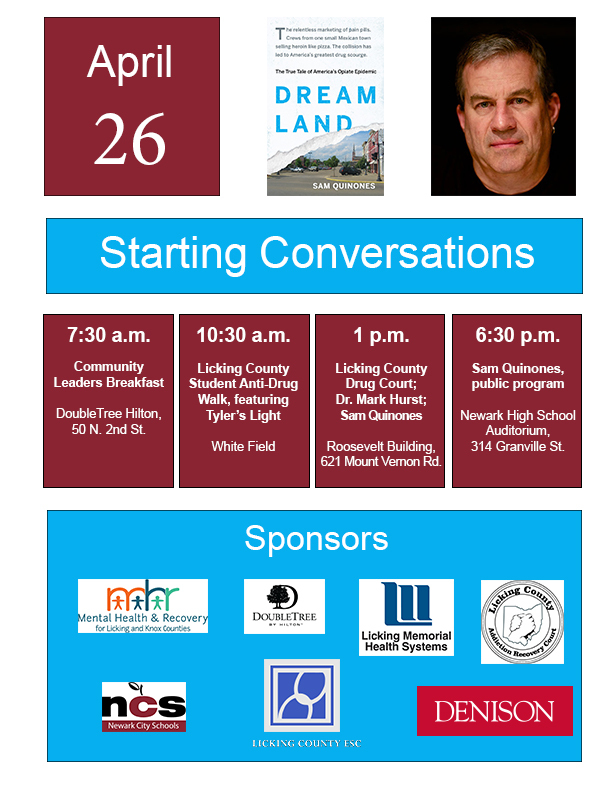 Author and Journalist Sam Quinones will speak that evening in the Newark High School Auditorium on the topic. Sam's book, Dreamland, chronicles the spread of opiates and heroin throughout the nation, from the impact of pharmaceutical drugs like OxyContin to the influx of black tar heroin originating from the small county, Xalisco, Nayarit, in Mexico. Mr. Quinones will be in Newark throughout the day, meeting with community leaders, Licking County Courts, county school officials and more. We invite everyone to the Newark High School Auditorium at 6:30 p.m. on April 26 to hear Mr. Quinones speak.